Inspect and adjust exterior equipment for proper operation; make note of any leaks or other possible problems. Our weekly cleaning services start at $140 per month. This includes all normal chemicals for sanitization, pH and alkalinity control. Our technicians will bring the chemicals with them; you don’t have to worry about storing any chemicals at your home. To schedule service or request more information please call our office (214) 347-8016 or CLICK HERE to request a no cost, no obligation price quote. Some of our customers prefer to handle the pool cleaning themselves. For these people we offer our Chemicals-Only service. In this case, we will visit your pool on a predetermined day once a week to test and adjust the chemicals for sanitization, pH and alkalinity control. Our technicians will bring the chemicals with them; you won’t have to store any chemicals at your home. We have extensive experience restoring pools anywhere from “slight cloudiness” to a full-blown swamp. No matter how large or small the job, we’ll be happy to provide a quick estimate free of charge, and get started on the recovery process right away. In some cases, it may only take a calculated chemical treatment and a filter cleaning & inspection for us to get your water clear again. In more extreme cases, it may be necessary for our technicians to drain the pool, remove leftover debris and algae, and then pressure wash and/or acid wash the entire pool as needed. (Fortunately, for pools that need to be turned around on a tight deadline, we have a heavy duty commercial pump that can discharge as much as 15,000 gallons an hour!) Once the pool has been refilled, we will replenish the chemicals and restore the filters to proper operating conditions. 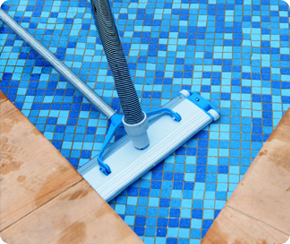 Call us or submit a request for a quote for any emergency pool cleaning services. If either of these services are of interest to you, please give us a call. Your satisfaction at A Better Pool Service is always guaranteed. If at any time your pool isn’t sparkling clear the way you expect it to be, please give us a call so that we can fix it right away. Call us or submit a request for a quote on our weekly cleaning services.